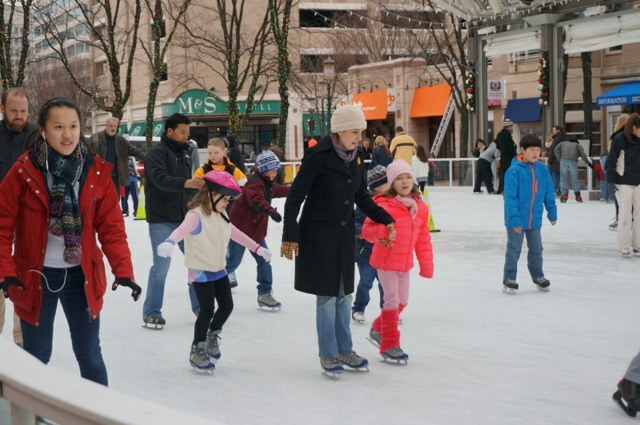 Reston Town Center has opened its Ice Skating Pavilion for the season. Friday night marked the rink’s debut, and it will remain open through mid-March for skating, according to Reston Town Center staff. The Ice Skating Pavilion opens at 11 a.m., seven days a week. The rink closes at 7 p.m. Sundays, Mondays and Tuesdays; and at 10 p.m. Wednesdays and Thursdays. Late-night skating until 11 p.m. is available on Fridays and Saturdays. The rink will host a “Rock ‘N’ Skate” night weekly on Fridays from 8 to 10 p.m., and a “Cartoon Skate” with kids’ characters like Scooby Doo and The Cat in the Hat on Saturdays from 11 a.m. to 1 p.m. In addition, the pavilion is available for birthday parties, fundraisers and other gatherings and will host ice skating classes. Three sessions of ice skating lessons are available this season. Sessions are $125 per skater and include four 30-minute lessons on Saturday mornings from 9:30 to 10 a.m. or 10:15 to 10:45 a.m. Sessions begin Nov. 19, Jan. 7 and Feb. 4. Registration is available online. For more information, visit the Ice Skating Pavilion page on Reston Town Center’s website.